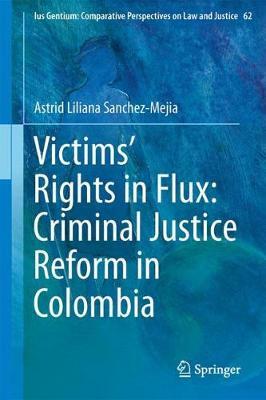 Contributing to the literature on comparative criminal procedure and Latin American law, this book examines the effects of adversarial criminal justice reforms on victim's rights by specifically analyzing the Colombian criminal justice reform of the early 2000s. This research focuses on the production, interpretation, and implementation of rules and institutions by exploring how different actors have employed the concept of victims and victims' rights to promote their agendas in the context of criminal justice reforms. It also analyzes how the goals of these agendas have interplayed in practice. By the early 2000s, it seemed that the Colombian criminal justice system was headed towards a process characterized by broader victim participation, primarily because of the doctrine of the Constitutional Court on victims' rights. But in 2002, the Colombian Attorney General promoted a more adversarial criminal justice reform. This book argues that this reform represented a sudden and unpredicted reversal of the Constitutional Court's doctrine on victim participation, even though one of the central justifications for the reform was the need to satisfy human rights standards and adhere to the jurisprudence of the Constitutional Court on victims' rights. In the criminal justice reform of the early 2000s and its subsequent modifications, the promotion of a dichotomous interpretation of the adversarial model-which conceived the criminal process as a competition between prosecution and defense-served to limit victim participation. This study examines how conceptions of victims' rights emerged out of the struggles between different and at times competing agendas. In the Colombian process of reform, victims' rights have been invoked both as a justification for criminal sanctions and as an explanation for crime prevention and restorative justice. After assessing quantitative and qualitative data, this book concludes that punitive approaches to victims' rights have prevailed over restorative justice perspectives. Furthermore, it argues that punitiveness in the criminal justice system has not resulted in more protection for victims. Ultimately, this research reveals that the adversarial criminal justice reform of the early 2000s has not substantially improved the protection of victims' rights in Colombia.